‘Community’ Returns Tomorrow Night and We’ve Got Previews and More! 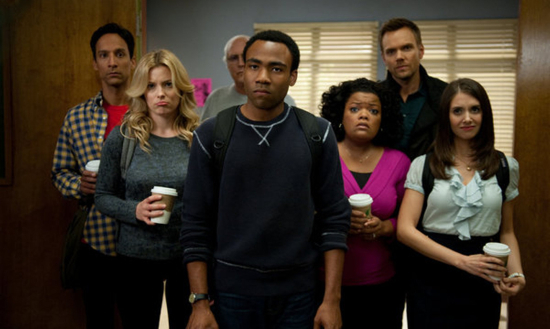 Even though things looked a bit dire last year when NBC put one of our favorite shows, the awesome Community, on extended hiatus, all now is well in the TV Universe again as the show is set to return tomorrow night. To commemorate this great occasion, we’ve got a ton of videos to share with you today. Among them are vids where Gillian, Yvette, and Joel (who wants to make out with all of you) discuss the big return of the show. Plus, take an early look at Greendale with some sneak peeks and get your fix of the Dean and Jeff as Jim Rash joins Joel on the NBC lot. That’s Academy Award Winner Jim rash to you. Check out all the videos (and a coupe extra pics) after the break. Look for Community tomorrow night (Thursday) at 8/7C on NBC. It’s fate may be sealed by NBC, but that hasn’t stopped Community from being one of the most original and brilliant comedies on TV today. NBC has yet to make a decision on picking the show up for another season due to it’s mediocre ratings (damn you, Big Bang Theory!) while they are more than happy with the numbers for the new comedy Outsourced. Before the decision gets made, we still get brand new adventures from our favorite Greendale Community College clique, and this week, things get even more interesting as Hilary Duff guest stars. From NBC. After a classroom smackdown with a group of “mean girls” led by Meghan (guest star Hilary Duff), Britta, Shirley, and Annie bond with Abed by turning him into the ultimate “mean girl.” Meanwhile, Jeff and Troy embrace a zen-like spirituality under the guidance of a groundskeeper when they come across a secret trampoline on campus. Determined to uncover the source of their new bliss, Pierce ends up taking a disastrous turn on the trampoline and lands in the hospital. We’ve got 2 brand new, can’t-miss clips from the episode for you after the jump, so check them out and catch Community this Thursday night on NBC.